When the subway is next door, the address is Vida! Remember how at the end of last year when we said that low-rise and mid-rise boutique condos would be extremely popular in the GTA in 2015? Well, Toronto has another one in the works, and it goes by the name of Vida Condos, a new project by Castle Group Developments in the Bayview Village area. Vida Condos will boast an interesting design by HCA Architecture, featuring a three-, six-, and eight-storey stepped exterior, creating plenty of space for balconies and terraces without having a huge impact on the streetscape. Vida will still stand out though, especially with its iridescent glass outlined by concrete stone. The arched entryway, flanked by stone and glass, will also be a head turner. The suites at Vida Condos range from 328 to 1,600 square feet with a variety of studio, one-bedroom, two-bedroom, and three-bedroom floor plans, many of which also have dens. Prices will start from $199,990 and range all the way up to $1 million. What we really like about Vida is that there is a wide range of suites for singles and young couples, while there are still great options for empty nesters, end users, and investors. A few of the impressive interior features and finishes at Vida include 9’ ceilings, soaring windows, spacious closets for storage, high quality plank laminate flooring, granite countertops, ceramic tile, European-style cabinetry, full-size stainless steel appliances, and every suite will have either a balcony or terrace. The storage space and full-size appliances are becoming a rare find in today’s condo market, so those features really stand out at Vida!  Located at Sheppard Avenue East and Bayview Avenue, Vida Condos is the next step in condo living along this evolving corridor. Development has been popping up along Sheppard a lot over the past few years and the future definitely holds more condos thanks to the Sheppard subway line. Vida Condos will be just a few steps from Bayview Station, which is only one stop away from Yonge Station. Having that connection to all the amenities of North York and downtown Toronto makes Vida’s location very valuable. In addition to nearby transit, the Don Valley Parkway/404 and Highway 401 are easily accessible for those who need to commute to work by car. Bayview Village is well known for its great shopping with over 100 retailers lining the streets. Vida Condos will also be within a close proximity to the Shops at Don Mills, Fairview Mall, and the new Whole Foods on Yonge. Vida is also bringing its own collection of amenities to the neighbourhood, exclusive to residents, of course. There will be a multi-purpose party room with a chef’s kitchen and a sports bar for catching the game with friends and neighbours. The landscaped outdoor area is perfect for barbecuing and dining alfresco, and the fitness centre is good for burning off those burgers and hot dogs with state-of-the-art cardio and weight equipment. If you are interested in learning more about Vida Condos by Castle Group Developments, register today. Occupancy is scheduled for 2017, and a preview opening is coming soon!